A feed adviser registered on the Feed Adviser Register (FAR) managing 12,500 dairy cows plus est. 400 followers, plus approx. 2,000 beef animals explains advice provided to 250 dairy cows. 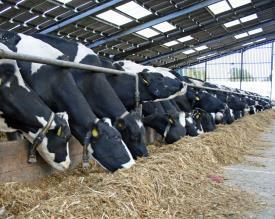 "I focus on improving forage quality during harvesting and particularly storage/feedout. Also, forage budgeting to maximise efficient utilisation." "Diet formulation was designed to optimise rumen health and efficiency, and promote dry and transition cow management strategies to ensure freshly calved cows are able to utilise the production diet and achieve target milk output." "My farmer client and I take a holistic view when it comes to managing dry cow management and nutrition. We introduced a heat detection system and new fertility targets to reduce calving interval. We introduced better grassland species and fodder beet into the rotation to improve output from farm grown feeds." "Herd milk yields increased from 8,500 litres to 10,500 litres with better fertility (CI down from 440 to 396). Major improvement in transition cow health (reduced incidence of Ketosis, Metritis, DA's). Significant improvements in forage harvesting and utilisation through better education and budgeting created more consistent and better balanced rations."